Given the existence of records, an optimistic ‘give’, it is possible to trace details of homes through history. The relevant records for Preston are those for manors, the wills of local folk, indentures, early censuses and maps together with awards which are like snapshots of who lived where at a specific time. twenty-eight-year gap between 1732 and 1760. Thus, over 281 years, there is a complete record except for seventy-seven years. Many of the missing years may be completed from summaries and later court notes that refer back to properties changing hands during the lost periods. Additionally, copies of individual manorial records are kept loosely at Hertfordhire Archives and Hitchin Museum. The significance of these records is that specific cottages and pieces of land were assigned a set annual rent which was payable to the Lord of the Manor. That fee varied from property to property but, in those days of no inflation, the rent did not change over centuries. Thus, if the rent on a property was 18/- in 1664, the rent was still 18/- in 1922. (Occasionally, a property would be split into parts and each part carried a fee, the sum of which was the same as the fee of the original property.) This makes tracing the history of home-ownership at Preston feasable. The same point is made in The Common Stream by Rowland Parker, which is a fascinating historical study of the Cambridgeshire village of Foxton. In it he explains how the history of individual houses can be examined. If the tithe maps and awards of the nineteenth century are used as a starting point, it is possible to work back using manorial records. He notes that the researcher is helped as the rents of homes ‘remained unchanged for centuries’. In the case of Preston, there are two historical maps that show each home in detail and have an accompanying ‘Award’ which notes owners and occupiers: a) 1811 - 1816, with an Award and also a matching valuation in 1825 and b) the Tithe Map and Award of 1844. The manorial records sometimes mention the tenants in properties at a given time, and these may often be married with the census details and the notes on the map awards so that the cottages in the manorial records may be identified. Thus, Daniel Joyner left a house at Preston Green to Elizabeth English, wife of John, rent 6d and another to Sarah Andrew, wife of James, rent 6d. Now that we have identified the cottages, and know that each of their annual rents was 6d, we can work back through the manorial records to see who owned them. These cottages were the property of the Joyner family throughout the eighteenth century and were referred to as ‘two tenements and orchard at Preston’ on 13 October 1773. They had been combined in the ‘Survey of Temple Dinsley rents 1715’, when their rent was 1/- and they were owned by John Joyner and Daniel Joyner before him. There is no record of these properties in the 1664 Survey of the Manor of Temple Dinsley, so it may be inferred that these homes were built after that time, possibly by Daniel Joyner. However, it is recorded that there is a spine beam in Laburnum Lodge dated 1653. The following information is based on my interpretation of all these records. I do not claim infallibility during this exercise. It is appropriate that I write this on the day that Einstein’s theory of light has been debunked! Taking the Swain family back another generation? There is an article about the Swains of Preston at this link: Early Swains. It begins with Edward Swain who died in 1752. There has been a considerable debate among Swain watchers about the identity of Edward’s father. This may be settled as a result of this examination of manorial records. On the basis of this, were Stephen and Edward Swain related. Was Stephen, Edward’s father? 29 August 1669. (Stevenage is around three miles from Preston.) If this was the Stephen mentioned in the Dinsley records, he would have been about 71 in 1715. Probably the best way to confirm this is to obtain Stephen’s will. But a brief search does not indicate it exists. Perhaps a more fruitful search can be made when next at Hertfordshire Archives. From my research, I believe this to be incorrect and that the Red Lion is considerably older. This clearly relates to the sale of the Red Lion with its three acres of land that stretched around to Back Lane. The rent for this property was 18/-. 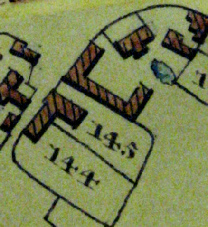 In the Manorial Records, there is no other property with a rent of 18/- - it is unique. Moreover, when transactions about this property are recorded, there can be no doubt that they are referring to the same piece, as will be seen. Note that the rent is 18/-, but the previous owner was not William King (as stated in the article) but Leonard King. The extract noted above is dated 20 October 1673. It refers to the same property held by John Riches and in the right margin it adds, ‘now Ed(ward) Swain’s’. John Riches was taxed for two hearths in 1662. 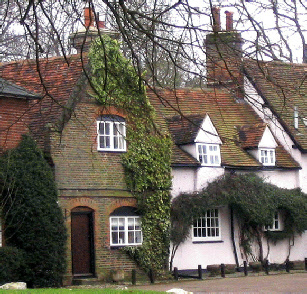 This means that the larger of the two cottages that comprise the Red Lion was built before 1664 - about fifty years earlier than previously thought. To Thomas Browne a messuage on Preston Green called the ‘Homehouse’ from Dennis Browne. To John Bowstred, a messuage at Preston inherited after death of mother, Frances Bowstred. To John Clifford and wife Mary, a messuage on Preston Green from Richard Wheatley. To Grace and Mary Carrington, a messuage at Preston Green from John Carrington. To John Heath jnr a messuage cottage and part of an orchard at Preston Green from John Joyner. To Mary Browne, a cottage and 6½ rods of land near Preston Green, from Ralph Bowstred.